DESCRIPTIONS: Brand new 1:18 scale diecast car model of 1967 Ford Mustang Custom “Eleanor” Gone in 60 Seconds Movie (2000) die cast car model by Greenlight. Customized, movie themed packaging Serialized chassis Brand new box. Rubber tires. Has steerable wheels. Made of diecast metal. Detailed interior, exterior, engine compartment. Dimensions approximately L-10.5, W-4.5, H-3.5 inches. 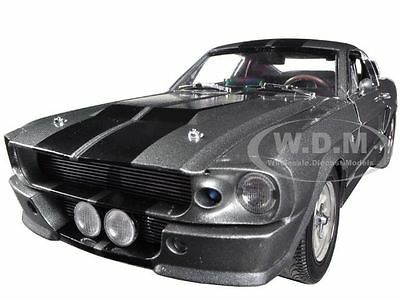 DESCRIPTIONS: Brand new 1:18 scale diecast car model of 1967 Ford Mustang Custom “Eleanor” Gone in 60 Seconds Movie (2000) die cast car model by Greenlight. Customized, movie themed packaging Serialized chassis Brand new box. Rubber tires. Has steerable wheels. Made of diecast metal. Detailed interior, exterior, engine compartment. Dimensions approximately L-10.5, W-4.5, H-3.5 inches. PAYMENT INSTRUCTIONS: We gladly accept paypal. Tracking info is free upon request. SHIPPING INFO: We do combine shipping cost for two or more items purchased. Please check shipping and payment section. In order to receive combined invoice for multiple purchases, please purchase items and let us know when you are done shopping, so we can send you one combined invoice. We can only combine shipping cost if items paid in one transaction. Dear Valued Customer! We appreciate your business. BUY WITH CONFIDENCE Fast Order Fulfillment 99% of orders are shipped within 24 hours or sooner. Simple Return Policy Thirty days simple returns. More than 10 Years of Experience Family owned and operated, we’ve had the experience of selling online for more than 10 years. Satisfaction Guaranteed! Our feedback says it all. And now, we hope to have the chance to prove we are the best to you! Competitive Pricing and Unrivaled Selection We are the number one direct distributor of diecast model cars in the USA, so we are able to provide very competitive pricing. Our stock selection is unrivaled with over 4,500 different items. Quality Shipping & Handling We package all our orders with care using bubble wrap to protect models from damage in transit. Each model that has a fragile window box is covered with carton protection. Excellent Customer Service Our customer service is second to none with thousands of returning, satisfied customers from all over the world.